Tampa Bay Golf and Country Club is a 55+ community, north of downtown Tampa, in sunny San Antonio, Florida. Just 25 miles away from the striking Gulf of Mexico, this gated community includes a fine assortment of single-family homes from several builders. The community is situated around 27-holes of golf and offers great amenities along with a low-maintenance lifestyle. Tampa Bay Golf and Country Club is situated on 730 acres and is protected by a 24-hour manned gate. In addition to the lush fairways and rolling hills of the golf course, several small lakes dot the landscape. Streets are beautifully landscaped and wide enough for golf carts -- a popular mode of transportation within the neighborhood. Residents of Tampa Bay Golf & Country Club may choose from several golf or social membership plans or pay per round. In addition to playing golf, residents enjoy the services of the multi-million dollar on-site clubhouse, complete with pro shop. At the library, residents can enjoy some quiet reading time or work on computers. Social areas include a spacious ballroom for parties, weddings, banquets, and other events. Less formal gatherings take place at the activities center or at the gaming and card rooms. Tampa Bay Golf and Country Club also has its own restaurant, the Grille Room, that is open for breakfast, lunch and dinner.Residents can also work out at the fitness center, play tennis, or get together for shuffleboard. The huge outdoor pool has an extra large deck suitable for pool parties. Residents can take their canine friends to several dog parks that are located throughout the community. Homebuyers can choose from a variety of resale homes available. The comomunity consists of 1,336 single-family homes. K. Hovnanian built a variety of single-family floor plans that range from 1,432 to 2,619 square feet. Homebuyers can customize their homes by choosing individual features, upgrades, and paint colors. Included elements are tile floors in bathrooms and kitchens, Corian counters in baths and granite counters in kitchens, 42-inch kitchen cabinets, 2-inch faux wood blinds, and more. Golf cart and three-car garages are also available. Many of the home sites offer desirable views and high levels of privacy as they back up to conservation areas and ponds as well as the golf course. Homebuyers can select from a variety of resale homes that were built by previous builders such as Lennar, Transeastern, US Homes and Engle Homes. Each of these builders offered a variety of floor plans and optional features. Lennar Homes offered many different floor plans that range in size from 1,276 to 2,553 square feet. These elegant single-family homes are offered on a resale basis with homesites that range from 50 to 75 feet wide, many of which enjoy nature or golf course views. Tampa Bay Golf and Country Club offers a lifestyle like no other, all with low Pasco County taxes. While this 55 and better community is a golf lover's paradise, it offers many other ways to stay active including tennis, water aerobics, and fitness classes. In addition, Tampa Bay Golf and Country Club employs a full-time activities director who keeps the social calendar full and organized with on-site activities and day trips. Residents have easy access to hospitals and other medical facilities. Tampa Bay Golf and Country Club in San Antonio, FL is about 15 minutes away from the quaint town of Dade City, which is full of unique restaurants and charming shops. Residents are only 25 miles away from the beautiful Gulf of Mexico. A 30 minute drive going south will lead to downtown Tampa, which is adequately close to enjoy the rich culture of Tampa Bay but far enough from the hurried commotion of city life. Other cities of interest in a 40 mile radius include Lakeland, Clearwater, and St. Petersburg. With all the great amenities and well-built homes, Florida's active adults are sure to love Tampa Bay Golf and Country Club in San Antonio, Florida. The main clubhouse is located at the heart of the community. 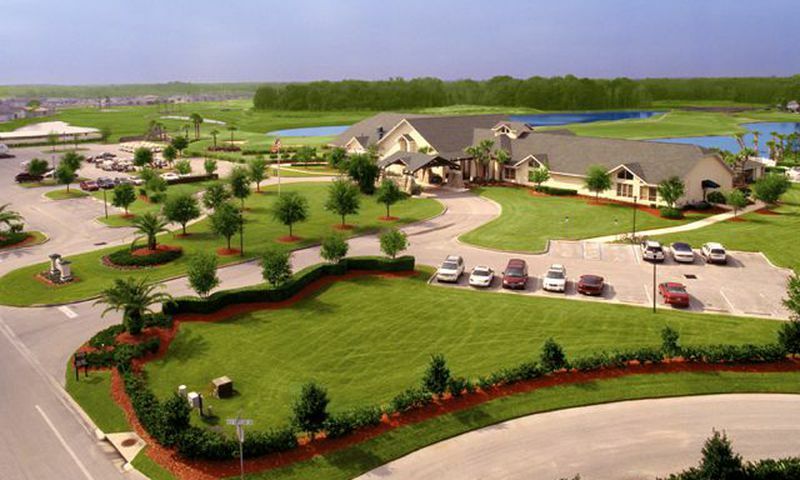 The smaller community center offers additional amenities for residents of Tampa Bay Golf & Country Club. There are plenty of activities available in Tampa Bay Golf and Country Club. Here is a sample of some of the clubs, activities and classes offered here. The Fairways Collection offers three models ranging from 1,432 to 1,724 square feet of living space with two to three bedrooms, two bathrooms, and an attached two-car garage. The Clubhouse Collection offers four models ranging from 1,780 to 2,115 square feet of living space with two to three bedrooms, two to two-and-a-half bathrooms, and an attached two-car garage. These models offer open floor plans and eat-in kitchens. The Island Collection is the largest collection offered by K. Hovnanian. Offering 2,038 to 2,619 square feet of living space each model has at least four bedrooms, two-and-a-half bathrooms, and an attached two-car garage. With so much extra space these low-maintennce models are great for hosting family and friends from out of town. The Lennar 50 Series offered six models now available on a resale basis only. These floor plans ranged from 1,276 to 1,676 square feet of living space with two to three bedrooms, two bathrooms, and an attached two-car garage. All models offer covered patios perfect for entertaining guests. The Lennar 65 Series offered four models now available on a resale basis only. These floor plans range from 1,779 to 2,056 square feet of living space with two to three bedrooms, two bathrooms, and an attached two-car garage. Residents love these homes for the great low-maintenance exteriors. The Lennar 75 Series is the largest single-family home collection offered by Lennar. These four model are available on a resale basis only ranging from 1,997 to 2,553 square feet of living space. These models offer two to four bedrooms, two to three bathrooms, and an attached two or three-car garage. These models were well designed with open floor plans and private master suites. Transeastern Homes offered a variety of single-family home models in the community that are available on a resale only basis. Engle Homes offered a variety of single-family home models in the community that are available on a resale only basis. US Homes offered a variety of single-family home models in the community that are available on a resale only basis. I’ve had a House here for 10 years as me second vacation home. It a convenient location and not far to go to beaches. The people are super friendly, beautiful club house and pool. Lots of activities and the restaurant has great food. The golf course is challenging and the par 3 is a fun little course. When my older kids come they love playing tennis and playing pool. Plus I feel very safe here in our gated community. I’ll take walks at 10 at night and not feel scared at all. The houses are very well kept and beautiful. It’s a great place to live or have a winter home. THIS IS A GREAT PLACE TO LIVE. MANY ACTIVITIES AND FRIENDLY PEOPLE. ALSO A GOOD INVESTMENT. THE BOARD ARE VERY ACTIVE AND DO A FABULOUS JOB. I THANK THEM ALL FOR THEIR TIME AND WORK. The place is very crowded, everything is rush and the service at the bar and dining facilities is substandard. It appears to me it's all about a profit motive and not about service. The attendants have attitudes and appear to be overworked and underpaid. new home build quality is good.dealing with hoa not so good. Tampa Bay GCC has a good assortment of homes by different builders so it doesn't look so cookie-cutter. Prices are reasonable, the amenities are nice and there is lots going on in the community. 55places.com is not affiliated with the developer(s) or homeowners association of Tampa Bay Golf and Country Club. The information you submit is distributed to a 55places.com Partner Agent, who is a licensed real estate agent. The information regarding Tampa Bay Golf and Country Club has not been verified or approved by the developer or homeowners association. Please verify all information prior to purchasing. 55places.com is not responsible for any errors regarding the information displayed on this website.